Kepco has introduced an option (identified by suffix C) to optimize 100W, 200W and 400W BOP models for driving capacitive loads. This option makes the BOP more suitable for a wide variety of applications such as solar cell/solar panel testing, testing of piezoelectric driving devices, capacitor testing, driving and testing of capacitive transducers, and powering industrial- or lab-type applications with capacitive or capacitive-resistive loads. BOP C option units are designed to operate in a stable manner in Voltage or Voltage Limit mode for capacitive loads up to 10 millifarads. They are also stable with any R-C load combinations. They are also stable when driving any R-C parallel combination where load R is > or = to nominal value and C is < or = to 10mf. load r (nominal value) = nominal output voltage/nominal output current (e.g., bop 36-6mc, r = 36/6 = 6 ohms. to prevent current limit mode operation, the equivalent impedence of the r-c parallel load circuit must be greater than the nominal r value at the working frequency. static specifications representing accuracy for various influence parameters are identical to the standard bop models. ripple and noise specifications are better (approximately 50% lower) for the c option units compared to the standard bop. Source and sink 100% of their current rating. Separate control circuits for voltage and current with automatic crossover to current and voltage limits. 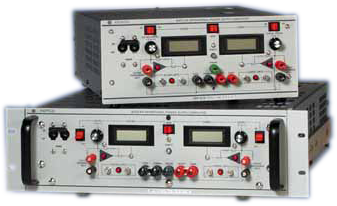 Zeroable preamplifier available for scaling and summing external signals. Optional BIT 4886 provides 16-bit IEEE 488.2 talk- listen control with SCPI support. Optional BIT 802E provides ethernet control either through a web page or by using SCPI commands via Telnet. Optional BIT TMA-27 connect BOP to Kepco's single-address multiple instrument serial bus for long range (>300m) control from IEEE 488.2, RS 232 or VXI-based hosts. Optional BIT 488B or BIT 488D offer listen-only GPIB support in binary or Hex format.